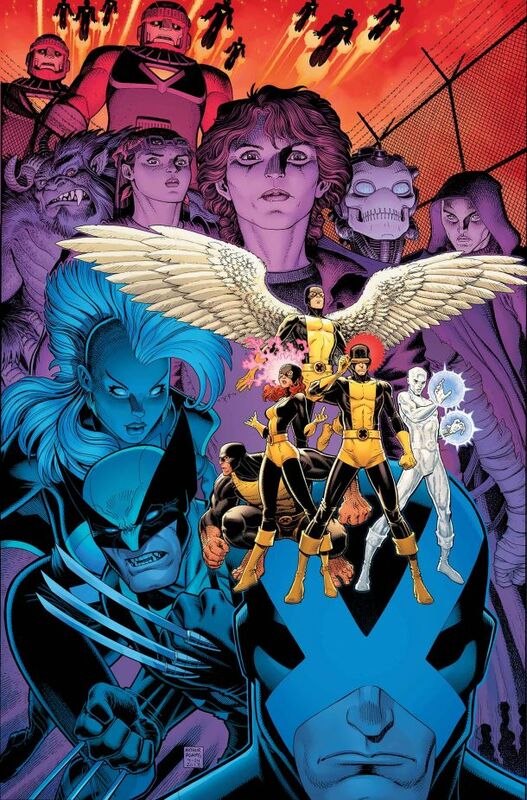 The current X-men status quo, in place since 2011’s cross-over event Schism, has the X-men divided into two factions. One, lead by Cyclops, is the more militant of the two, dedicated to protecting and preserving the mutant race at any cost. The other, lead by Wolverine, runs the Jean Grey school and is dedicated to living out the dream of Charles Xavier, educating the next generation of mutants to live in peace with humanity. Since Brian Michael Bendis began shepherding the franchise late last year (the maddeningly prolific scribe currently writes All New X-Men and Uncanny X-Men), these two factions have also been joined by the time-displaced original five X-Men, who have arrived in the present to see the world didn’t exactly turn out how they’d planned. Yeah, X-Men comics are still complicated. Which brings us to Battle of the Atom the first cross-over event of Bendis’ run, and his edition into a classic canon of X-book stories: the dystopian future tale. From classics like “Days of Future Past” (the title of which, at least, will provide the name of the next X-men movie) to recent successes like the “Final Execution” arc in Rick Remender’s Uncanny X-Force, this is a venerable tradition that virtually any long-form X-men run will include an iteration of. In the interest of full disclosure, it’s here I should admit that the “dystopian future” stories are usually some of my least favorite X-Men tales. It’s not necessarily that I have any problem with time travel stories (if I did, I’d probably be driven to stop reading comics entirely), just that the X-Men version of this usually plays out pretty much the same way. Our heroes are forced to contend with an unimaginably dark future caused by some mistake they have made, they see traumatized, darkened future versions of themselves, some people die, and the future is saved, or at least potentially averted. Rinse. Repeat. It’s hard to get too invested in a future that, because of the nature of the medium, will probably never come to exist, and rare is the story where the future has enough resonance on the present to truly change anything for our characters. The first issue of this event is a bit muddled and slightly chaotic, which partially seems intended and partially appears to be the result of overstuffing. There is the opening monologue of Illyana Rasputin (better known as Magick, and sister to Colossus), who has visited the future that will play a role in this event, there’s a quick stop by the Jean Grey school for some banter, an attack by new mutant Animax, an attack by sentinals, a team-up with Cyclops’ Uncanny X-Men, and a late-issue cliffhanger that basically alludes to the over-used format alluded to above. Some of this works pretty well. One of Bendis’ strengths as a writer is his ability to craft funny quips and believable banter between his characters. This occasionally makes his casts sound a little same-y, but absent a complete inability to write Emma Frost (one of my favorite X-Men characters), he has mostly avoided that problem in his X-Men work so far. The scenes set at the Jean Grey school have the sort of laid-back feel of a group of people accustomed to living in comfortable chaos, and Kitty Pryde has an easy banter with the original X-Men, who she is charged with instructing. When she tells them “Something’s wrong in Phoenix, Arizona,” and Bobby Drake responds, “Isn’t that the slogan of Phoenix, Arizona?” it feels both programmatically constructed and surprisingly funny. It’s a joke in the Aaron Sorkin format, but in the moment, it works. What works less for me, so far, is setting up the stakes of the event, which seems to be premised around something that has been true of the books since Bendis took over, and which presents its own potential solution within the issue. It seems that suddenly the idea of the original X-Men creating time paradoxes is going to form the center of this event, but that has been discussed since they first appeared, and when one seems to be created here, a mutant’s powers fix the problem virtually instantaneously. The art in the issue is uniformly very good, though the styles of Cho, Immonen, and Grawbadger are different enough that it can be jarring to switch between them. Each also has a different take on the characters, which means Jean Grey might look one way on one page, and then surprisingly different on the next. They even have different ways of laying out their pages, so standard gridding can give way to a more impressionistic layout without warning. Sometimes this is good, as in the layout of Jean Grey reading Animax’s mind and discovering her backstory. There’s a great flow to it that captures the fragmentary nature of memory, and its wonderfully succinct, a dialogue free page that explains the new character’s life and outlook efficiently and cogently. But the mix of styles gives this issue the feel that it was thrown together, as if the event was rushed to the point that the artists never really got to get together and develop a rhythm or a strategy to combine their styles. Ultimately, Battle for the Atom #1 is mostly exposition for what’s to come, and in that regard, it didn’t make me particularly optimistic that the event will blow my mind. It seems like a programmatic retread of stories we’ve seen time and again. While I’m sure Bendis will have some sort of spin to put on the story, there’s little evidence of anything markedly different here. I’m a sucker for a good cross-over, when characters who aren’t in the same book regularly can interact (and I did enjoy the brief Cyclops/Kitty interaction here), so I can’t say I’m not at least prepared to enjoy the event, but it would be hard to call me excited. With this introduction, I’d classify myself as cautiously optimistic. If Bendis can tell a story of the future that doesn’t entirely rely on past stories, he may create a landmark moment in his still-young run. And if not, hey, maybe Magick and Psylocke can grab a psychic Cliff bar or something.